Our Rhode Island genealogists are available to research on location. They will find and analyze the best records available to further your family history research. They can search the archives and libraries in Rhode Island, as well as help you with other special requests. Our researchers are available to visit local archives and libraries to access unique record collections to help with your research. Below is a list of a few of the archives our Rhode Island researchers have access to. The Rhode Island State Archives contain town records that date from 1638 to the present day. The archives also hold state censuses at ten-year intervals from 1865 to 1935, state birth and marriage records from 1853 to 1897, and state deaths from 1853 to 1947. The archives are home to an extensive collection of maps as well. The Rhode Island State Library is home to the largest book collection in the state. This collection includes nearly every state and town history available, as well as a large amount of biographies and genealogies. Their collection is mostly legislation related, with their earliest holdings on this subject matter dating back to 1750. Some of their most popular sections of their collection include Rhode Island government manuals, which date back to 1867, and Rhode Island Acts and Resolves that date back to 1750. The Rockefeller Library has such an impressive collection that is has been referred to as the “second state archives”. Their holdings include an extensive book collection, with manuscripts that specialize in information on the New England colonists. Biographies and genealogies can also be found here. The Newport Historical Society has articles in its archives that date back to the society’s founding in 1854. Their archives contain works on the history of Newport County and the surrounding areas with over 12,000 volumes dedicated to this subject. Rhode Island was created by refugees fleeing from other colonies, and therefore the historical works here also include information on early southeastern New England families. Records of early colonial southeastern New England governments can be found here as well. The Rhode island College collections include personal papers of central figures in Rhode Island, photograph collections, and personal paper collections on social issues in Rhode Island. View the James P. Adams Library Catalog to access genealogical materials for your research. The Providence College Archives and Special Collections contain many personal papers of leaders and activists in Rhode Island. Rhode island genealogists can also find genealogical resources in the President Kennedy news clippings collections and Microfilmed newspaper collections dating back to 1932 (includes the Boston Chronicle and Providence Chronicle. For those looking for photographs, this library maintains various photograph collections. Researches may access many archives by Browsing the Complete List of Collections at the Phillips Memorial Library. The Providence City Archives have an in-depth collection of historical and genealogical records. These articles include early town records and vital records, such as birth, death, and marriage records from 1636 to the mid-20th century. Other records contained here are probate records and indices, a property records, records from government proceedings, and tax records. The Naval HIstorical Collection at Naval war College maintain several collections including college archives, manuscripts, and oral histories relating to the history of naval warfare and the history of the Navy in Narragansett Bay. Visit the McKillop Library Catalog to search for genealogical holdings. The Roger Williams University’s library is home to an extremely large book collection as well as periodicals, newspapers, biography indexes, genealogies, and family histories. 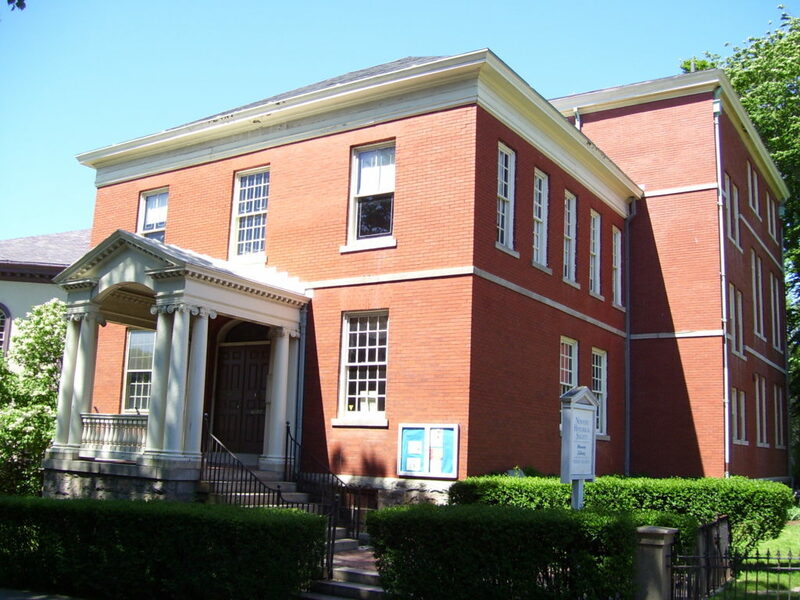 The university is also the location of the largest collection of information on the Baptist church and its members in New England. The Rhode Island Historical Society has collected more genealogical articles than anywhere else in the state. Their archives include local histories, manuscripts, censuses, as well as cemetery and military records. They also have family bibles, family histories, and religious records. The society’s archives also hold birth records from 1636 to 1898, marriage records from 1636 to 1900, death records from 1636 to 1920, and passenger lists from 1620 to 1941. The library collections include 1.1 million books and 8,000 periodicals. Some of these texts include government documents, manuscripts and Archives, maps and nautical charts, and microforms amounting to 2.3 million additional items. The Douglas and Judith Krupp Library maintain several special collections that include Newspapers from Bryant University since 1946, historical timelines and photographs, the History of women at Bryant, and US women and WWII letter writing project. The library also holds records for the first 125 years of Bryant university. Researchers may access the Douglas and Judith Krupp Library Catalog for genealogical resources. The Rhode Island Black Heritage Society is one of the oldest African Heritage societies in the country. Their mission, in their own words, is “the preservation of African Diaspora descendant’s historical artifacts – books, art, papers, and images, as well as facilitating the interpretation efforts by those seeking to enlighten others about our heritage”. All of the articles in their archives focuses on the history and accomplishments of the African American community in Rhode Island. The Rhode Island Jewish Historical Association provides information from the past and the present on the Jewish community in Rhode Island. Their archives include city directories, information on different synagogues and their members and archives of different publications. These include the Jewish Voice, the Jewish Herald, and the Jewish Voice and Herald. Researchers can also find information on individual members of the Jewish Rhode Island community and a selection of obituaries. The American-French Genealogical Society is home to collections that focus on cultural, genealogical, historical and biographical information on Americans of French and French Canadian descent. They hold cemetery, headstone, and obituary records. There are also records of French-American marriages in Rhode Island. Our Rhode Island genealogists specialize in researching several types of documentation and are not limited to the list above. For more information or specific inquiries about our genealogists, please feel free to contact us.